The “Blog” of “Unnecessary” Quotation Marks: "real seafood"
You know, I don't mind immitation crab. 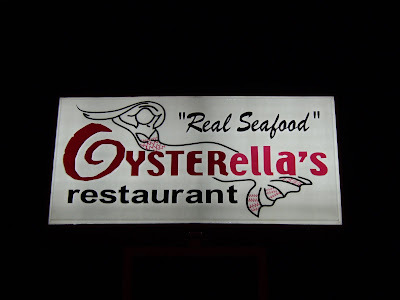 I don't know about any other kinds of "real" seafood they've got though... Thanks, Miranda. Reminds me of an episode of Cheers, where Cliff Clavin was bellyaching about eating "bef" at the Hungry Heifer. Norm had had enough of it so he said, "You don't hear me complaining about the 'loobster', do you?" Looks like they serve "mermaid." If it weren't for the unnecessary quotes from a campy old design standpoint that sign is awesome. I bet the inside of the restaurant is a time warp with the original red vinyl booths and all.